Match day eight in the Ladbrokes League 2 saw Annan lift all three league points in this early season basement battle courtesy of a solitary goal scored by top goal scorer Aidan Smith in the 37th minute, it was a goal to savour which earned Annan their first home league victory of the season and for the time being keeps a safety net between Annan and the clubs at the bottom of the league. Annan had to work hard for the points as they were pushed all the way by a stubborn Cowdenbeath side who rode their luck at times but the visitors were never out of the game especially late on when Cowdenbeath were exerting pressure on the Annan team who for the last 5 minutes had lost the services of central defender Steven Swinglehurst. The opening 20 minutes were fairly evenly contested before Annan started to exert pressure on the visitors defence. Jack Brannan came close with a low raking shot in the 24th minute which went narrowly past the post. Minutes later Annan had what looked like legitimate claims for a penalty kick brushed aside by the referee when Scott Roberts cut into the box but the referee booked the Annan player for diving much to the annoyance of the fans who were crying out for a penalty. It was a good spell of pressure from Annan, Scott Hooper finished a well constructed move down the right with the deep cross going a begging. Annan went ahead minutes later when they were awarded a free kick 25 yards out and Aidan Smith’s superb struck free kick was perfectly placed over the defensive wall and into the keepers top left hand corner to give Annan a deserved half time lead. Cowdenbeath brought on a couple of substitutes at the start of the second half but like the first half it was Annan who took the game to their opponents, Rabin Omar was unlucky when his shot cracked off the base of the post in the 47th minute. Omar then went close with a header from a Ryan Sinnamon cross. Joe McGovern in the Cowdenbeath goal then pulled off a magnificent save to deny Owen Moxon who’s well struck shot through a ruck of players looked to be heading towards the net. Annan continued to press forward when Omar’s shot hit the side netting. It was all Annan as they laid siege on the visitors defence and shots from Aidan Smith and Omar could quite easily have paid dividends. In the 70th minute Cowdenbeath won a free kick in an almost identical position to the one that Annan scored from but Fraser Mullen’s effort failed to hit the target going narrowly wide of the post. The visitors were riding their luck but as the game edged towards the last 15 minutes however Cowdenbeath were still very much in the game. Aidan Smith always a threat up front headed narrowly past from a Sinnamon free kick in the 75th minute. The introduction of Blair Henderson in the last 15 minutes indicated Annan were not content to sit back on their slender goal advantage. Cowdenbeath were finding it difficult to penetrate the resolute Annan defence, Kyle Miller blasted over the bar for the visitors in the 80th minute, Annan then lost the services of Steven Swinglehurst with a nasty gash to the eye with Ayrton Sonkur replacing the defender. Watson and Syme were then booked after Moxon was at the end of a rash challenge. In the end Annan deserved to lift the points, Cowdenbeath’s lack of penetration up front must be a concern to the Fifers who have only managed to score 4 league goals , defensively they are proving a hard nut to crack but trying to solve the attacking option will almost certainly define how their season progresses. It was a day of mixed fortune in SPFL2, Elgin fought back from a 2 goal deficit to square the match against Stirling Albion, Stenhousemuir moved 2 points closer to the top spot with a convincing 3 goal victory over Edinburgh City. Berwick Rangers had the best result of the day with a 2-0 victory at the bookies favourites for the title Peterhead. Clyde’s stuttering start to the season continued at Links Park where Montrose picked up all the points with a narrow 3 -2 victory. Annan’s next match is in 2 weeks time when they are away to Berwick Rangers in the William Hill Scottish Cup, Annan’s Development team are at home to Newton Stewart in the South of Scotland League next Saturday. 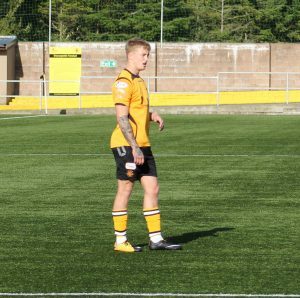 Annan Athletic – Jim Atkinson, Scott Hooper, Jack Brannan, Owen Moxon, Peter Watson, Steven Swinglehurst ( Ayrton Sonka 86 min), Dan Orsi ( Blair Currie 74 min) , Ryan Sinnamon, Aiden Smith , Rabine Omar, Scott Roberts ( Brandon Luke 90 min). Substitutes not used Alex Mitchell (gk), John Cunningham , Peter Murphy, James Creaney. COWDENBEATH – Joe McGovern, Fraser Mullen, Harvey Swain, Alasdair Smith, Scott Rumsby, David Syme, Robbie Buchanan (Ben Stirling 78 min), Kyle Miller, Josh Morris ( Cameron Muirhead HT ), Ryan Connelly ( Trialist HT ), Bradley Smith. Substitutes not used: David McGurn GK, Matthew McNally, Charlie Denton, John Overstone.